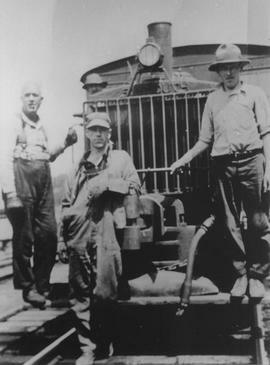 Merrill & Ring "4 Spot" on M&R Dock at Woodyard and Beach Camp around 1929.Left to right: Charlie Pierce (Camp Foreman), Big Dave Thompson (head barely visible), Ed Aldridge, Jow Ozanich. 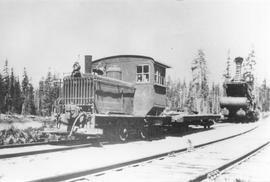 Merrill & Ring -0-4-0 - 14 ton Plymouth Gas Locomotive with steel laying float car ahead and "crummy" behind at Edith Lake Camp, 1929 - 1930. "Ausie" Pete Craddock in cab.Photo by: Ed Aldridge. Bunk houses loaded on skeleton cars ready to go to Edith Lake Camp site. Looking south.Photo by: Ed Aldridge.